Ford never included door seals, but we have found this is the answer to loose and rattling doors on all early Fords. An ideal universal type seal, Hollow core for improved compressability and sealing - 3/8 X 7/32 X 20' Roll. 1928-31 closed car bottom door seal kit. Goes at the bottom of the door to make a tight seal. It gets sandwiched between the interior door panel and the door. Contains enough for two doors. This is an 8 foot piece of rubber that seals the bottom of the doors on open cars. The doors originally had a piece of metal spot welded to the bottom for this rubber to slide into. Note: Order A-19009 if you have reproduction doors or if the metal retainer is missing. The clip for holding the upholstery to the door. It fits Coupes, Tudors and Pick-ups. Made in USA. These tube style rivets hold the wind lace retainer in place on the 28-9's. One kit per car required. Made in USA. This steel strip holds the wind lace on the front of the door opening on 1928-9 model A's. This is the rubber core only for windlace that seals the top of the door opening. Correct shape to properly seal the door opening. The rubber sealing strip is installed in a metal channel that is screwed to the wood door frame at the bottom of the window opening. This retainer helps keep rain and dirt from going inside door. 23" long. You will need 2 of these. Used on: 1928-29 Fordor 60-A,B,C; 1929 Cabriolet 68-A; 1928-29 Town Car 140-A; 1929-31 Briggs Town Sedan Fordor 155-B,D; 1929-31 Briggs Std. Fordor 165-B,D and 170-A,B. (Will not fit 1931 Slant Window cars). These stainless polished steel strips mount vertically and hold the wind lace that seals the back edge of the door glass. Set of 2, Made in USA. These stainless polished steel strips mount vertically and hold the wind lace that seals the back edge of the dor glass. Set of 2, Made in USA. 1930-31 Front Door mouldings for the slant windshield models, Left side. These mount vertically along the front edge of the door. It gets screwed to the door, the felt channel attaches to it, and the upright door garnish moulding screws to it with 3 screws. These were used on all S/W 4-doors, A-400's, Victoria, and S/W Cabriolets. Made in USA. 1930-31 Front Door mouldings for the slant windshield models, Right side. Front Doors Window Channel Kit for 28-31 Tudor sedan, 28-29 Coupe & 30-31 Pickup. Kits include the following: all necessary molded channels with clips attached, upper window sponge seals, "T" shaped anti rattle (when required), lower glass cushioned rubber and adhesive. One kit does both front doors. Made in U.S.A.
Front Doors Window Channel Kit for 30-31 Coupe. Front Doors Window Channel Kit for 28-31 4 door. (Not 1931 slant windshield model). Front Doors Window Channel Kit for 1931 Slant Windshield 4 door. Front Doors Window Channel Kit for 1928-29 Closed Cab Pickup, 1928-29 Panel Delivery, and 1926-27 Coupe or Tudor Sedan. One of these kits will do both the right and left hand doors. Kit includes 2 upper door seals, 4 felt channels with the mounting clips installed, sealant, and 2 glass bumpers. Rear Doors Window Channel Kit for 28-31 4 door. (Not 1931 slant windshield model). Kits include the following: all necessary molded channels with clips attached, upper window sponge seals, "T" shaped anti rattle (when required), lower glass cushioned rubber and adhesive. One kit does both rear doors. Made in U.S.A.
Rear Doors Window Channel Kit for 1931 slant windshield 4 door. Kits include the following: all necessary molded channels with clips attached, upper window sponge seals, "T" shaped anti rattle (when required), lower glass cushioned rubber and adhesive. One kit does both rear doors. (also fits 1/4 windows). Made in U.S.A.
Rear quarter Window Channel Kit for 28-31 Tudor Sedan. All kits include the following: All necessary molded channels with clips attached, upper window sponge seals, lower glass cushion bumpers and adhesive. One kit does both rear quarter windows. Made in U.S.A.
Rear window channel Kit for 1930-34 coupe's with a back windows that rolls up and down. U.S.A. 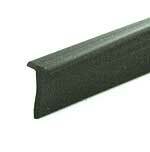 Felt Glass Channel for the 1928-31 Model A Ford door sliding window. This is the 32 inch felt channel with metal core that run vertically on the sides of the side window. These are normally held in place with the A-48235 clips that were riveted to the channel. Window channel clip set for the door felt strip retainers. Includes 2 metal clips with rivets to secure the top and bottom of one channel. Order 2 sets per window. 1928-31 4-Door Felt Retainer Front Door. 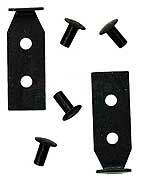 U-shaped pieces of metal that nailed to the vertical door wood for felt channels to set into. Used on 4-doors with wooden framed doors. Made in USA. 4-Door Felt Retainer 1928-31 Rear Door. U-shaped pieces of metal that nailed to the vertical door wood for felt channels to set into. Used on 4-doors with wooden framed doors. Made in USA. Felt Glass Retainer 30-31 Tudor Sedan & Pickup, Left & Right Front. 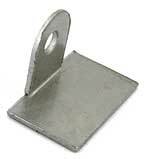 U shaped piece of metal that was spot welded and riveted in the door for felt channels to attach to. Rivet is included. Front refers to hinge end of door and rear refers to latch side of door. Made in USA. Felt Glass Retainer 30-31 Tudor Sedan & Pickup, Right Rear. The U shaped piece of metal that was spot welded and riveted in the door for felt channels to attach to. Rivet is included. Front refers to hinge end of door and rear refers to latch side of door. Made in USA. Felt Glass Retainer 30-31 Tudor Sedan & Pickup, Left Rear. Felt Glass Retainer 1930-31 Coupe & Sport Coupe, Right Rear. Felt Glass Retainer 1930-31 Coupe & Sport Coupe, Left Rear. Felt Glass Retainer 1930-31 Coupe & Sport Coupe, Right Front. Felt Glass Retainer 1930-31 Coupe & Sport Coupe, Left Front. Felt Glass Retainer 1928-29 All Coupes, Tudors, & Dix Delivery Right Front/Left Rear. Felt Glass Retainer 1928-29 All Coupes, Tudors, & Dix Delivery Left Front/Right Rear. Top Window Cushion Any Year. A 30" piece of sponge rubber seal moulded to form a good cushion and seal at the top of door window. Need one piece per window. Held in place with any good auto trim adhesive. Made in USA. Inner upper door seal set for the 1928-29 Coupe, 1930-31 Pick-up and 1928-31 Tudor (Front). Aluminium channel with a rubber insert that goes under the garnish mouldings. Rests against window glass on windows that roll up and down. Set of 2. Made in USA. Upper Door Seal Set for the 1930-31 Coupe. Aluminium channel with a rubber insert that goes under the garnish mouldings. Rests against window glass on windows that roll up and down. Set of 2. Made in USA. Upper Seal Set for the 1928-31 Tudor Rear windows. Aluminium channel with a rubber insert that goes under the garnish mouldings. Rests against window glass on windows that roll up and down. Set of 2. Made in USA. 4-Door Upper Door Seal 1928-31 Front. The 4-doors used an upper door seal that was different than the other A's used. They are steel with the rubber insert. Rear is 21-1/4" long, front is 23" long. Made in USA. 4-Door Upper Door Seal 1928-31 Rear. 1928-31 Upper Door Seal Only for the Aluminium strip style . Rubber insert only for the upper door seal. 32" long. Not for the 4-doors. Original mouldings were made out of steel, repos are aluminium. For aluminium only. Made in USA. 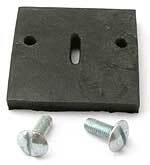 The U-shaped rubber for mounting the rear window and the quarter windows in the framework. 15' long. Made in USA. Glass Setting Rubber for the Rear Window Only. The U-shaped rubber for mounting the rear window and the quarter windows in the framework. 5'9" long. Made in USA. Glass Header Strip set for the 28-9 Coupes, 28-31 Tudors, 30-1 Truck . Sold in pairs only. Made in USA. Glass Header Strip set for the 1930-31 coupe. Sold in pairs only. Made in USA. Header Strip Screw set 1928-31. Screws to attach the above header strips. Enough for 2. Made in USA. Pickup Header Strip 1930-31. Strip of metal that nailed to the wood on the outer top edge of the door opening where the A-45890-A header strip doesn't cover. U.S.A.
Steelback Victoria Header Strip 1930-31 Left. Goes in the top of the door opening. Front and back edges require trimming for a neat fit. Made in USA. Steelback Victoria Header Strip 1930-31 Right. Leatherback Victoria Header Strip 1930-31 Left. Leatherback Victoria Header Strip 1930-31 Right. Door Top Cover Plate, For the 1928-31 Tudors, 1928-29 Coupes and 1930-31 Truck. This stamped steel panel covers the very top of the door. The door glass rolls up against this piece. Made in USA. Door Top Cover Plate, For the 1930-31 Coupes. 1928-31 Door Top Cover Plate Screw set. 6-pc set for holding the door top cover plates onto the top of the door. Made in USA. The rubber bumper inside the door on the steel arm style door checks. Set of 2. Made in USA. This square piece of rubber mounts in the door post, and the door check bumper bumps against this rubber instead of the post. 1 set does both sides. Set of 2. Made in USA. If your closed car does not have provisions for the footman loop on the door and the door post, this steel armed door check is the one used. It was used on and model A that did not use the rubber strap style. Set of 2. Made in USA. Authentic front door check set with the correctly shaped arm with the original 3 slots for door opening adjustments. Includes 2 arms, 2 stop washers, 2 tabbed washers, 2 rubber bumpers and 2 tubular rivets as originally used. The metal parts should be painted the color of the body. Similar to the front door check arms, except these have a sharper bend on them. Used on rear doors of all 1928-31 4-doors except slant windshield. Set does both doors. Set of 2. Made in USA. 1928-31 Rear door check Arm set. Just the arms. Made in USA. Only used on the original style door check arms to adjust how far the door could open. Metal style arm door checks only. and the tabs were bent around the clip so that it would not come off of the door check arm. These brackets are what holds the door check arm to the door. Originally, these were spot welded to the door. Set of 2. Made in USA. Pair of brackets that screwed to the door post for the door check arms to attach to. Used on late 28 through 31 straight windshield 4-doors. Set of 2. These are used with the rubber door check straps. They were used on all 28-9 closed cars, and the rear doors of all station wagons. Screw holes are 2-1/4" on centre. Sold each. Made in USA. 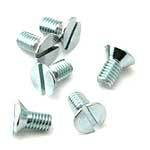 A set of 8 12/24 oval headed screws tha hold the A-162592-L Footman loops to the door and door post. Chrome Made in USA. The double loop door check strap 6" version. Application: 29-31 Station Wagon rear doors, 28-9 Coupes, 28-9 Tudor, 28-30 Closed Cab truck. All with side mount spare tyre. The double loop door check strap 7" version. Application: 28-30 Closed Cab Truck, 28-30 Panel Delivery rear door. The double loop door check strap 8" version. Application: 28-9 Coupe, Tudor. A flat strap with a 'T' end for the rear doors of slant windshield 4-doors. The narrow end was anohored to the door in the desired position with the A-162592-S retainer and the 'T' end slid in a cavity in the body. Holds the 'T' style rear door check strap to the door on slant windshield 4-doors. Door check strap set for the 1928-31 Model A Ford Roadster and Phaeton. Dark brown coloured leather straps with chrome plates. Comes with mounting screws. Set of 2. (2 sets required for a 4 door phaeton). This is the 48" long rubber that fits between the upper and lower sections of the windshield. .230" wide glass groove. The 42" long rubber that seals up the upper and lower windshield halves. .230" wide glass groove.